Do you know the difference between ecotourism, sustainable travel, responsible travel and volunteer vacationing? While there is a lot of overlap with each of these terms, they all have one common theme – that is to improve lives through travel and tourism. 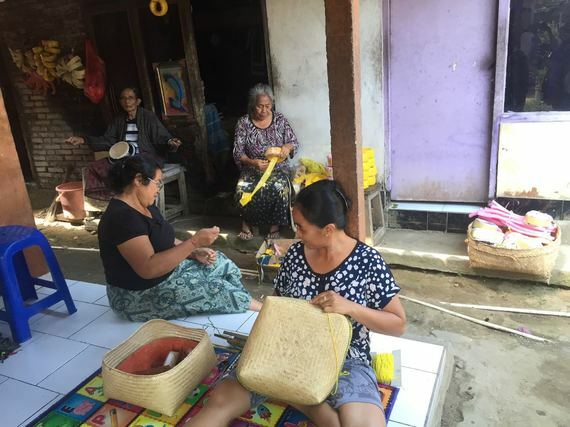 On a recent Yoga Retreat in Bali, Indonesia through international nonprofit, Go Eat Give, I experienced an all encompassing meaningful holiday where we actually supported the community we visited in many different ways, perhaps without even realizing it. Most visitors to Bali either head to the beach resorts of Kuta, or the hippie city center of Ubud. Our accommodations were at Puri Gangga Resort and Spa, a 4-star 20-bedroom property located in the highland village of Sebatu (about 30 minutes from downtown Ubud) in East Bali. 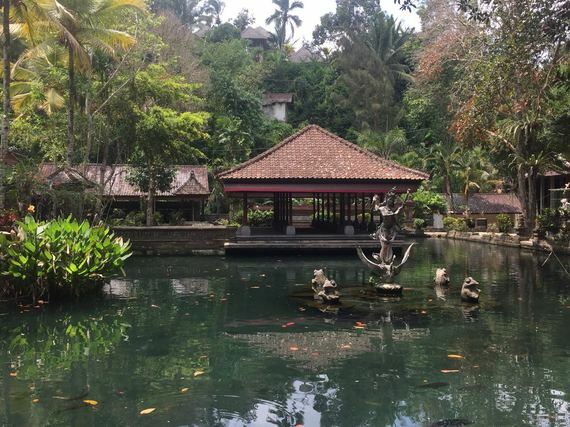 Enclosed by rice paddies and forests, the resort was a peaceful oasis overlooking Gunung Kawi Sebatu, a tranquil temple with gardens, and ponds full of blooming lotuses and enormous carps. The resort was small, yet charming. It blended well with the peaceful environment and embodied nature into everyday living. From the fishpond at the reception, the stone pathways leading to the rooms, to the open-air restaurant, I always felt the presence of life surrounding me. Even my luxurious villa had thatched roofs that naturally repelled mosquitos and furniture made of Indonesian teak wood. My bathroom was huge, boasting great views of the surrounding paddies, and had a partially open roof in the shower. When it rained, the water just drained off into the rocks and plants around my toilet. I felt I had the luxury of indoor plumbing, set in an all-natural ambiance. Each morning I woke up at the crack of dawn to the sounds of birds chirping and roosters crowing. I walked along the infinity pool in the morning mist of the forest, to attend my yoga class. At 7am, a few early risers gathered in a spacious room with open windows facing east on one side, and west on the other. This week, we practiced meditation and graceful poses, using The Warrior of Light by Paulo Coelho as a spiritual guide. A relaxed yoga session was followed by breakfast at the resort’s restaurant, Kailasha, with a bird’s eye view of the temple below. The 3-course breakfast service included a plate of fresh cut tropical fruits, Indonesian coffee or tea, and tropical juices squeezed to order. A woven basket full of assorted baked breads arrived with pineapple and strawberry jams made on premise. 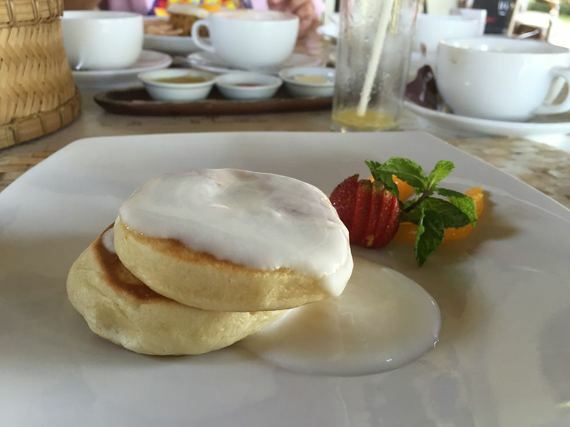 Options for Western and Balinese style breakfasts were presented – coconut pisang rai (steamed bananas), Martabak sayur (savory stuffed pancake), Nasi Goreng (fried rice), Dadar Gulung (sweet coconut pancake), or eggs and toast. Like most Balinese families, the restaurant bought all the ingredients very early in the morning, many of which were picked from the adjacent farms. I returned to Kailasha restaurant for dinner a few times, and enjoyed healthy, fresh and delicious local flavors. Baby spinach dressed with sunflower sprout and tossed in virgin coconut oil was the perfect Nature Healing Salad, while the main course, Balinese Tipat Cantok – rice cakes with steamed beans, carrots, bean sprouts and peanut sauce, made for the most scrumptious vegetarian treat. 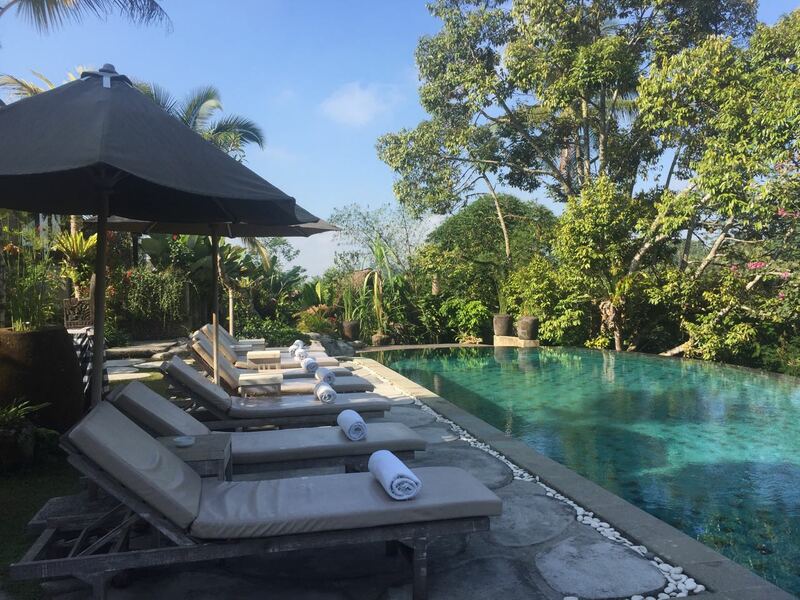 My intention of living in the village was not only to decompress, but also experience the authentic life in Bali. At the resort I stayed, there were activities designed to do just that. Puri Gangga offers a “Living in Culture” package that includes accommodations with daily yoga, afternoon tea, massages, and several cultural activities. Some of the evenings, young Balinese dancers and Gamelan players would be invited from the village to perform for the guests at the resort. Watching talented girls of 8-10 years of age up close, dressed in their colorful costumes, and synchronizing their eyeballs with the music, was simply mesmerizing. I looked around and noticed the reaction of all the other spectators – fixated on their camera lenses, wanting to capture every single moment of this special treat. 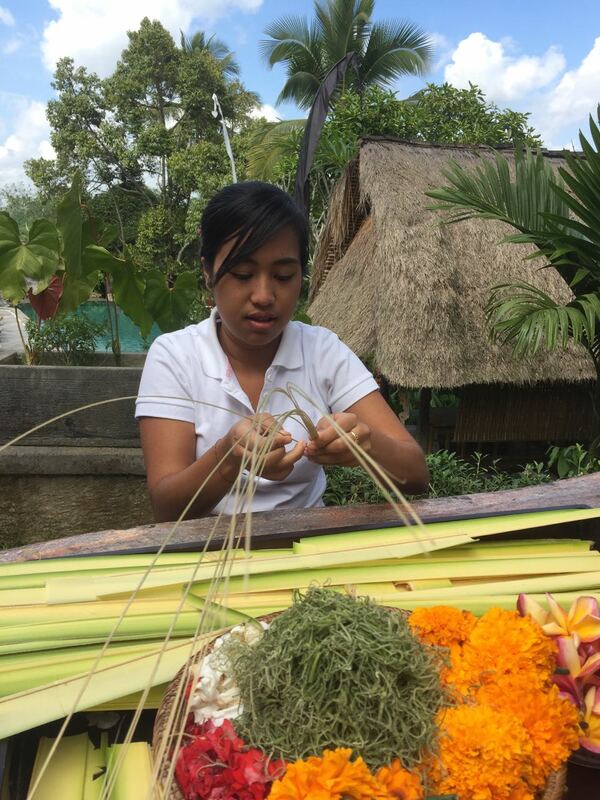 I learned to make Balinese Canang Sari, an offering where we weaved palm leaves and decorate the square shaped plate with bowls. It took me almost an hour to make one, and every Hindu household on the island makes 20-50 of these each day! While walking around the streets, you will see these offerings left at the doorsteps of businesses and homes after being blessed at the temples. During the village tour, I visited the workshops and homes of local artists. Everyone I came across was busy working on some craft they had honed – be it sculpting stone statues, decorating wooden carvings, painting wicker boxes, or weaving baskets. Many of the products looked familiar, as I had seen them in the markets. It’s hard to conceptualize the time and labor behind the knick-knacks we pick up as souvenirs, and understand that someone’s livelihood may be entirely dependent on our purchase. Everyone who worked at this resort was a member of Sebatu village, so my dollars spent remained mostly in the area. I visited the homes of a hotel’s staff – a petite girl in her early 20’s who taught yoga, led people on tours and conducted cultural lessons. She she lived with 50 of her family members in a compound where she had a little house of two rooms. Her parents slept in the kitchen, while she had a tiny windowless room to herself. When one of my friends gave her a generous tip of $100, she was super excited and narrated how she would purchase books for her younger sister, give some money to her mother, put some aside, as well as help with the temple maintenance. Imagine what a 21-year old in the western world would do with $100 in cash! I also signed up for a Balinese cooking class at Paon Bali Cooking School, where aunty Puspa and her husband, Wayan run an enterprise out of their home in another nearby village. 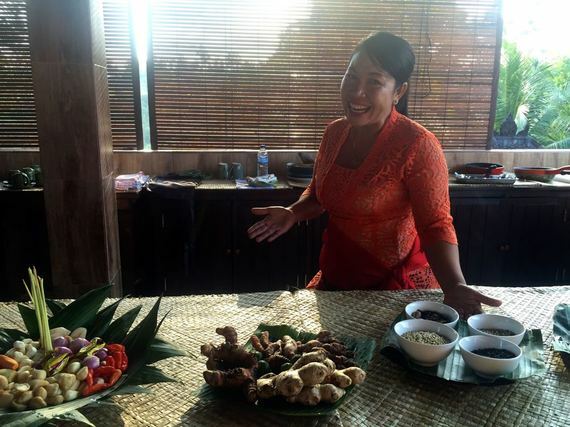 He picks up the guests, shows them around the rice paddies and brings them to their home, where Puspa teaches visitors how to cook 10 Balinese dishes in one session! Over the years, through the growth of their business, they have been able to employ many of their relatives and neighbors, who would otherwise be selling art on the streets for pennies. Here they get to walk to work, eat whatever they want, and have fun teaching tourists about their native cuisine. 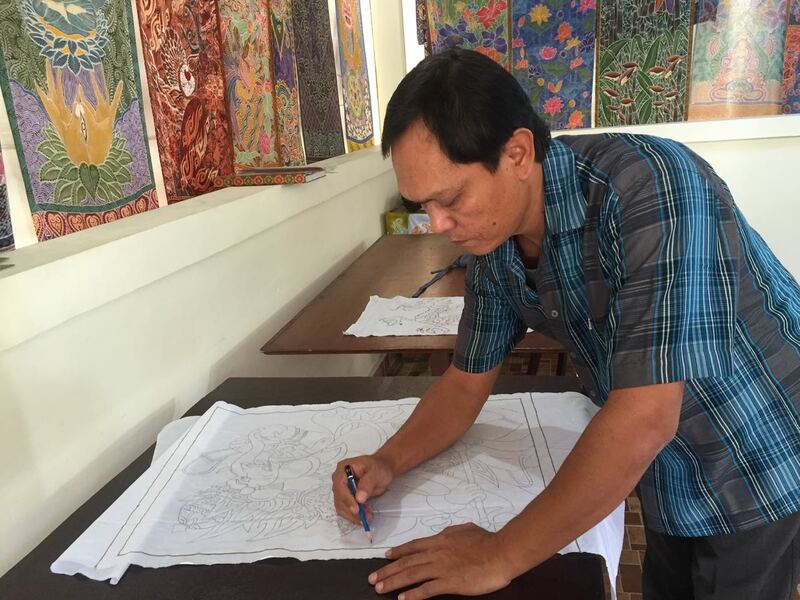 Batik is an ancient art form made with wax resistant dye on fabrics. Batik in Indonesia is perhaps the best known and an important part of their heritage. I decided to take a lesson in Batik at the home studio of a local artist, Widya where I spent about 5-6 hours learning the art from start to finish. I started with a blank piece of white cloth, stenciled a design with a pencil, and then drew it out with wax using a spouted tool called a canting. I wax stamped the borders of the cloth, while one of Widya’s many assistants, who are also excellent artists, help me correct my errors. They showed me my selection of all-natural colors to fill in between the wax. The cloth is then dried in the sun, boiled in hot water to remove the wax, and air-dried again. While I worked diligently to create a masterpiece, Widya’s wife took my lunch order and ran off to the kitchen to cook Gado-Gado (a traditional dish of cabbage, green beans and peanut sauce) and served it with fresh watermelon juice. It takes a lot of patience, good vision and a steady hand to create these pieces, and I was nowhere close to being able to fetch a price for my work! Widya sells his work to shops and galleries around the world. It can take him a week or a month to make a single wall hanging, depending on the intricacy of its design. Like Puspa, he has created a small business at his home to sustain other artists who don’t always get the fame they deserve. Lastly, I spent some time learning about the poverty in Bali’s villages and how it has impacted the children. I met with the staff of Bali Children’s Project (BCP) and learned that many of the families are so poor, that the parents unable to sustain, end up committing suicide. Young kids are left to fend for themselves and end up working on the streets selling cheap souvenirs. I also saw some of their living conditions where a family of 4-5 would sleep in one dingy dark room on a torn mattress with dirty coverings. BCP has enrolled 300 kids to attend school through a sponsorship program, but that is only a fraction of the kids in Bali who need help. I visited some of the schools where BCP sponsored kids are studying. We spend time doing arts and crafts with third graders. They took to me instantly, calling my name and teaching me words in Balinese. They were eager to show me their work and surrounded me when it came to picture taking time. Despite their circumstances, these kids were very outgoing – smiling, laughing and eager to know me. In my short time there, I couldn’t do much except donate some money to purchase beddings and commit to sponsoring two kids till the age of 18. It costs only $40/ month per child, a small sum in comparison to the big difference it can make in the life of a child. By receiving an education, these kids have some chance to break out of the cycle of poverty. When I think about all the lives that were impacted directly and indirectly because of my 10-day visit to Bali, I am pleased. I feel I was a sustainable traveler, leaving a positive impact on the environment, society and economy. 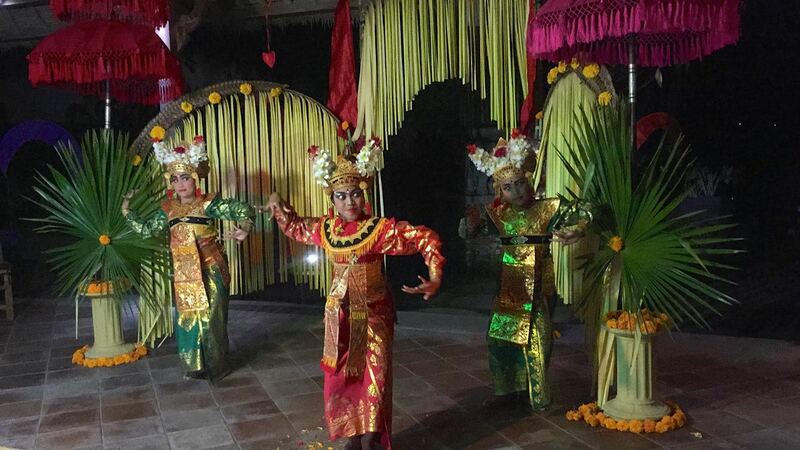 This entry was posted in Indonesia and tagged Bali, cultural travel, ecotourism, Indonesia, sustainable travel, yoga retreat. Bookmark the permalink.